Opened on Peachtree Street in 1929, this landmark events venue and centerpiece of the performing arts district in Atlanta was originally intended as the Yaarab Shrine Temple – as evidenced by its Moorish design – but ultimately developed into an opulent movie palace so over-the-top in appearance the local newspaper described it as having, “a picturesque and almost disturbing grandeur, beyond imagination.” The lavish theatre, now the only remaining movie “palace” in Atlanta, features two distinctively daringly exotic styles of architecture; the 4678-seat auditorium, which was designed for movies and live performances, replicates an Arabian courtyard, replete with a night sky of 96 embedded, flickering crystal “stars” and a fantastic projection of clouds that slowly drift across the “sky.” A rumor that one of the stars was a piece of a Coca-Cola bottle was confirmed in June 2010 with a little *attic* research. Its “Egyptian Ballroom” was modelled after a temple to Ramses II, and details of the ladies lounge include a replica of King Tut’s throne and makeup tables adorned with diminutive Sphinxes! 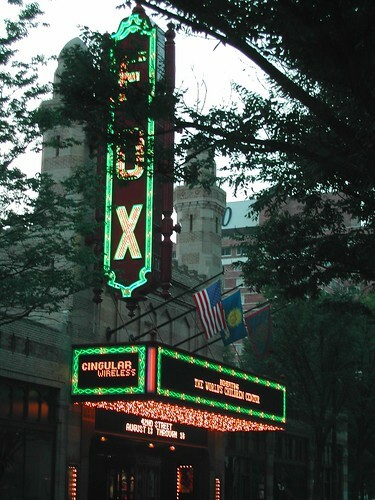 During the 40s, the Fox gained notoriety as the only Atlanta theatre allowing both black and white patrons; there was, however, a separate black box office, entrance, and seating. The old segregation wall and “colored” box office window stands unused at the back entrance, left in place for educational and historical purposes. A variety of fanciful and informative tours lets guests explore the many splendors of this beloved landmark theater; “The Fox Experience” demands a place on every student group’s Atlanta itinerary!